Sign up for free or join Alamance Makers Guild as a Maker Supporter. Alamance Makers Guild, based in Burlington, North Carolina is a 21st century organization focused on fostering community through a shared joy of making (technical to artistic, traditional to digitally fabricated, solid to virtual), learning and teaching, and creating opportunities for people from youth to retirees. The guild promotes STEM education and skills with the addition of the 'A' for Arts to make STEAM. Alamance Makers Guild works to help people start small maker businesses and supports creating an environment attractive to new manufacturing jobs for Alamance County. Monthly open meetings are free and open to the public and include a speaker, demonstration, or activity. Maker Faire Burlington is the guild's signature annual event that promotes the community of making and STEAM activities. The upcoming event will be held April 28, 2018. It is produced by members and volunteers, in addition to help from sponsors and the community. Set your calendar to exhibit, volunteer or attend! 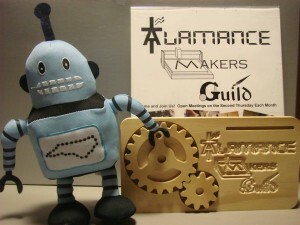 Founded in 2011, Alamance Makers Guild is a membership organization funded BY dues paying members. Monthly open meetings and events are mostly free, to serve the community. Your voluntary membership helps generate funds to be used for expenses associated with events, membership, and to reach back to the community in order to increase awareness of STEAM related skills and education in Alamance County. Become a Maker Supporter today! Join today as a member to help support open meetings, maker events & activities for the public, including Maker Faire Burlington!